Little Big Snake game is known as a blockbuster game that follows an identical concept to Slither.io, but it promises to take this classic IO game to a higher level when it provides the players with a lot of cool features to explore. 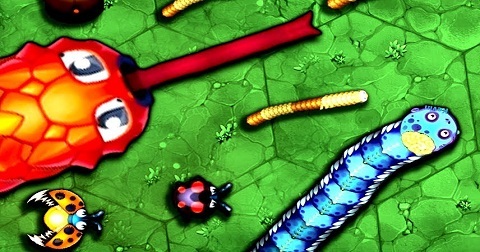 You will get a lot of fun playing as a cute snake making your way through a vast arena full of other opponent snakes. So let’s take this chance to prove your abilities now! Just like the title said, once you enter the arena of the game, you will bump into lots of snakes from the little ones to the big ones. As a hostile snake that is seeking more orbs to grow its length, you have to ensure that lots of food orbs will be consumed by you while trying to defend your head from crashing into the body of others. Possibly speaking, this gameplay will remind you of what you experienced in Slither.io, however, you will still find several different points in this new one. The snakes come out with awesome appearances, and there are several flying beetles that are flying around the arena too. When your snake is destroyed, you start controlling the beetle, make it land on the ground to collect more orbs. Slither.io doesn’t have this feature, so maybe Little Big Snake will be more captivated and attractive to you. Eating as many orbs as possible is such a good thing for you! This will help enhance your size a lot, but, you will grow up faster if you eat the dead remains of the defeated snakes. Hunting for the dead remains will be much more dangerous than just finding the normal generated orbs because you will face off against so many other enemies. They gather around the big pool of those remains a lot, and if you are not careful to protect yourself, you will die easily. Another different thing here is that whenever you make a speed boost to catch your prey, your mass and length won’t be decreased, conversely, it will help you consume more energy. So feel free to speed up when you want to chase your rivals or get away from dangers. Your main objective in this Little Big Snake is to become the largest snake of all, and this is also the main goal of other opponent snakes. Therefore, the game is going to be very brutal because nobody will give up on killing each other for a chance of dominating the arena. You must survive longer, prolong your life and fight to become the number one on the leaderboard. 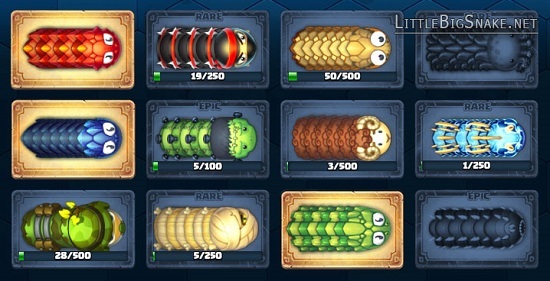 There are up to 60 skins you can unlock and utilize in Little Big Snake. Some skins can be unlocked if you are lucky to find them in the game, or if you complete a certain given mission. But, you can totally purchase them by spending your rubies. Shop is a place where you can buy more coins and rubies, or even a VIP accounts. Make sure you register an account so you can gain an access to this feature. The coins and rubies will have different prices. You should spend your earned rubies to buy some coins, but if no rubies are earned yet, you have to use your real money to purchase them. There are lots of quests with different missions and challenges to conquer. You should follow the instructions in the quests so as to complete them and earn a lot of rewards. Evolution system is a cool thing to explore. Now, you should remember to evolve your snake into a stronger one. However, evolution can cost you some coins, so make sure you earn enough coins before you evolve your snake. Also, if you donate the gold to the temples, your snake’s abilities will be much more upgraded. The game features a bunch of achievements for you. Try to stay alive in a fight as long as possible, play it well so you can obtain more achievements like warrior, elephant hunter, shorty, patty and more. Try your hardest to complete them, then, you will surely get rewarded for them. You will enjoy magnificent and amazing graphics. Feel free to make a speed boost anytime you want. Start to control a flying beetle when your snake dies. Join many quests and complete them to earn more rewards. Evolve your snake into a stronger one as well as enhance its abilities. Lots of items in the shop for you to purchase. Many exclusive skins you can unlock. Numerous awesome achievements to achieve. Nice environments to explore, such as water and rocks. 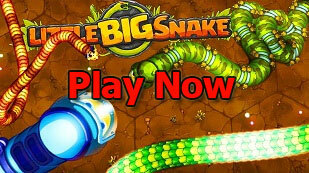 What's your idea of Little Big Snake Game?